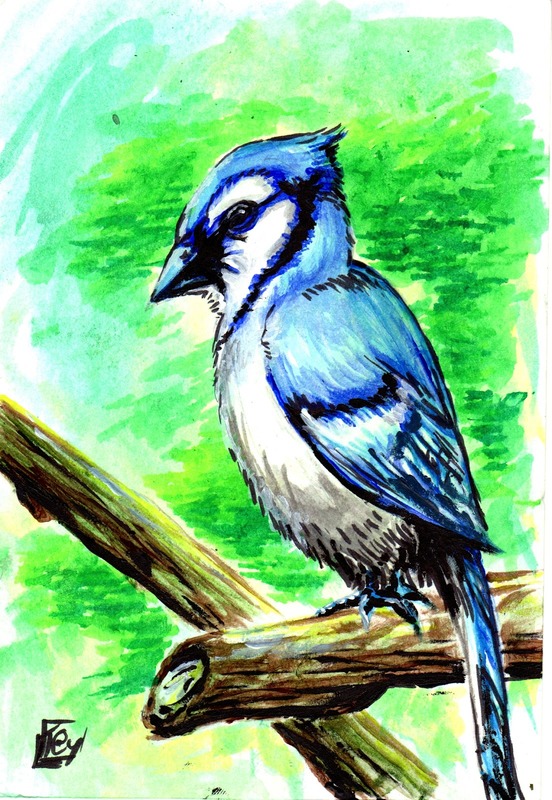 Taylor's Sweet Little Art and Nerd Site: Art Piece of the day- A Blue Jay! I'm changing it up a bit. No Masters of the Universe card today. Instead today's deviation is a blue jay! Yes, a blue jay! This blue jay did not fight in the great war of Eternia with King Grayskull nor did it run King Hsss and his snake men into the Void. No, instead this blue jay did something much more important in my eyes. This blue jay made a very important woman very happy. This woman is my Grandmother, and she is having her 87th birthday today! When I gave this to her, she told me how she did not have a blue jay and she was going to hang it up next to her cardinal picture that she has. I was excited and thrilled. And then I told her about my original idea of having a Rosie the Riveter style pin-up girl holding a bird who's feather color would match the uniform of the pin-up girl. She told me that she was happy to get just the bird! Such honesty! I love you very much. Well here's to you Ellen; I'm wishing you a very happy birthday! You can also see this art piece here.